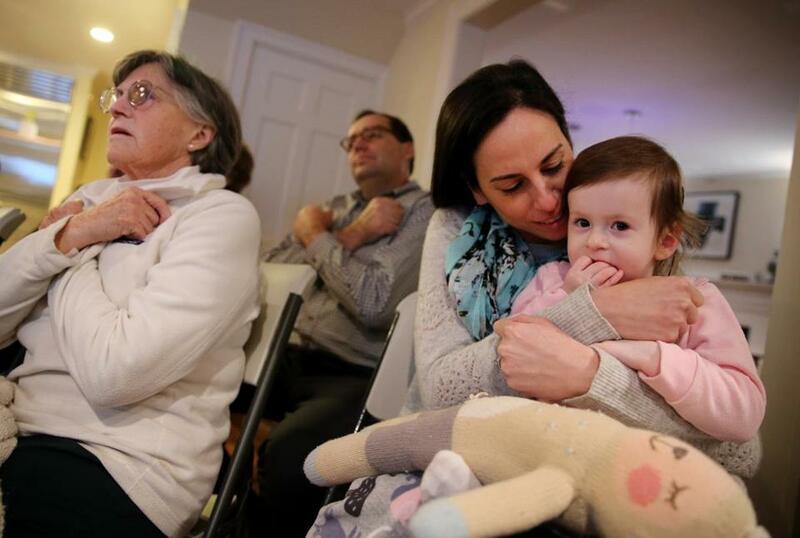 Glenda Savitz held her 2-year-old daughter, Samantha, while signing the word "love" during a sign language class at a neighbor’s home. NEWTON — Something small and profound is happening here along the banks of the Charles River. It’s a love story. It’s a story of a little girl who’s deaf. It’s a story of neighbors who’ve raised their own children and are now embracing a beautiful 2-year-old named Samantha. It’s a story of 20 neighbors who sit in silence to learn a new language so their littlest neighbor will know what their kids have always known: Community. Friendship. Inclusion. “This child will always be a child of this neighborhood,’’ said Terry Nowak, who grew up and raised three children here. To understand what’s taking place on Islington Road these days, you have to follow the path Samantha’s parents took to get here. Glenda and Raphael Savitz met at a social gathering in 2011 a week after Glenda, who grew up in Southern California and went to optometrist school there, moved to Boston. Raphael is a business consultant, a graduate of Yeshiva University. They were married in the fall of 2013. They moved to Auburndale in the summer of 2016. Three months later, Samantha was born. 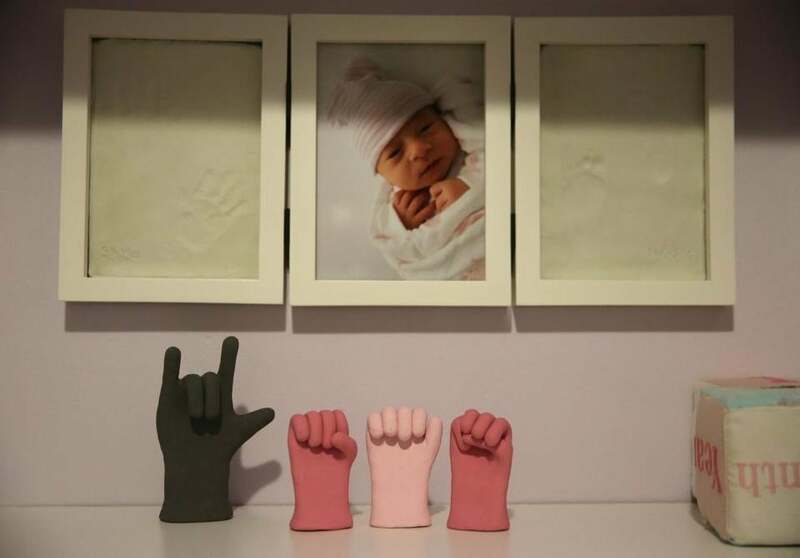 Within a week, newborn screening tests showed that their infant daughter was deaf. “She was the first deaf person my husband and I had known,” Glenda Savitz, 33, told me the other morning as Sam sat in her lap. Their first hint of what would come next from their neighbors was in the way they were welcomed when they first moved to the neighborhood. There were plates of cookies. There were greetings from neighbors in kayaks, bearing the promises of friendship. This is a place where elderly neighbors’ driveways are shoveled without prompting. If you’re sick, expect a casserole. And now this: The new baby on the street was deaf. Glenda Savitz uses signs with her 2-year-old daughter, Samantha. “We all have had children of our own and we were excited that this new baby was coming,’’ said Jill McNeil, who grew up in a small town in Pennsylvania and wanted that cozy neighborhood feeling for the two kids she and her husband raised here. “We were excited that a new baby was coming. There can be nothing better. Then there was this additional challenge. That’s how American Sign Language has become the second tongue now spoken on one end of Islington Road. Why? Because that’s Samantha Savitz’s language. And there was no way her neighbors were going to let her practice it alone. “People everywhere are looking to have a community,’’ said Lucia Marshall, a Memphis native who has degrees from Harvard and Yale and settled here 20 years ago. “Having something positive to rally around is a great thing. Sam is creating a reason for us to get together. If you think what these neighbors are doing is unusual – poignant and inspiring even – you’re right. Sarah Honigfeld, Sam’s teacher and mentor at The Learning Center for the Deaf in Framingham, has been a part of the little girl’s learning life since she was 3 months old. She’s watched her grow into the little girl who has become a model for her little peers. A set of sculpted hands that say "I love you Sam" in sign language. That’s what makes what’s happening in Lucia Marshall’s living room so powerful. These neighbors didn’t ask Sam’s parents’ permission. They hired an instructor. And got started. As winter’s grip tightened around New England the other night, Rhys McGovern, a hard-of-hearing speech language pathologist, went to work before a class of 18 in Lucia Marshall’s living room. He never spoke a word. And his students never missed a chance to learn. There were murmurs, whispers, and muffled laughter — the kind that often accompanies efforts to stretch and tackle something new. There were nods of acknowledgment and mutual appreciation. Standing before a projector and small screen, the kind that home movies have danced across for 50 years, McGovern went to work. In this serious silence, nomenclature was reviewed. New vocabulary verbs were introduced: Go. Like. Want. Eat. Play. Have. Make. 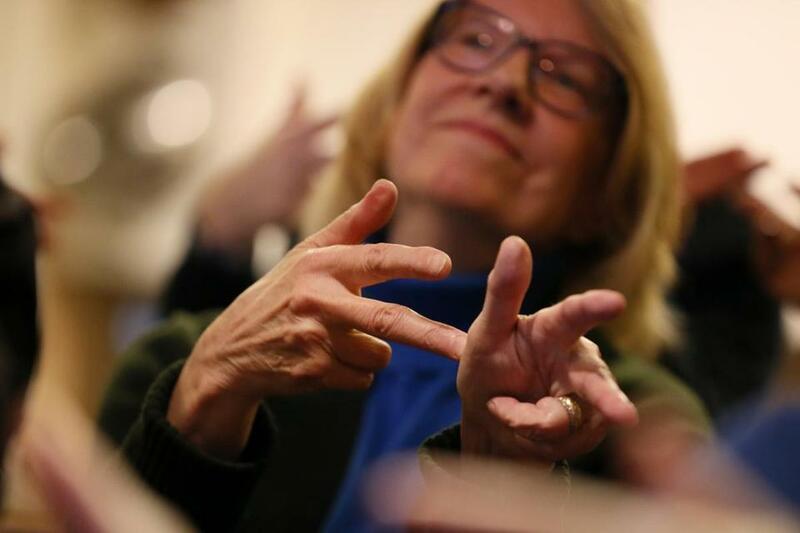 Jill McNeil learns the sign for car accident during a sign language class at a neighbor’s home. With 15 minutes remaining in class, Sam arrives in the arms of her father, and is greeted by welcoming signs from neighbors who want to learn her world. “One of the most emotional experiences having her is that I really learned about how much support and how much love there is here,’’ Glenda Savitz told me. “How much I’ve learned about other people. Raphael Savitz nodded as his wife spoke. And that starts at home. Friends like 19-year-old Henry Marshall, a Harvard freshman, who, like Sam, moved as an infant to this neighborhood he still calls home. Henry stands 6-foot-1. And like Sam’s parents, he knows what a special place this is. Sam’s family has erected a kid’s basketball hoop next to Henry’s regulation-sized basket. The little girl who’s found real family in all those people next door.